Let's celebrate the official arrival of spring at the charming Chais Brongniart also known as the Restaurant "In Carne." 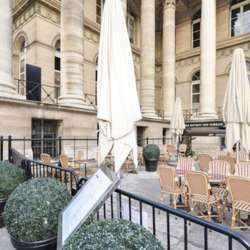 This trendy restaurant, located within the Palais Brongniart (Bourse building), offers plenty of space, which is great to meet many other global minds! It will be entirely ours for the evening, including the large terrace. In case of rain, there's plenty of covered space so this wouldn't be an issue at all. The entrance fee includes one drink (home made cocktail or glass of wine or beer or soft drink) plus 4 small tapas per person. This is a wonderful occasion to mingle and meet new friends and/or establish business connections in a magical setting! Beware of copies and taste the unique flavor of InterNations Paris Events, the largest expats' community in the world! To get there take the metro to Bourse (line 3). The exact address is 33 place we la bourse Paris 2.